Blueberries are so abundant right now, they're in every store, in HUGE containers, costing practically pennies! I walked into my mom's house yesterday and instantly smelled fresh blueberry pie. When I walked into the kitchen, I saw these beautiful little babies. So cute, so delicious, and SO EASY!!!! Using a whole wheat, ready made pie crust is the key to a simple and quick dessert or breakfast. I personally tried them at both meal times and they are equally as delightful! Serve with low-fat ice cream or fat-free whipped cream and maybe even a dash of lemon zest! Preheat oven to 400 degrees. Spray a muffin tin generously with non-stick cooking spray. In a small mixing bowl combine flour, sugar and cinnamon. Whisk until combined. In a small saucepan, combine blueberries and lemon juice. Stir until combined. Heat on medium heat and stir in the dry ingredients. 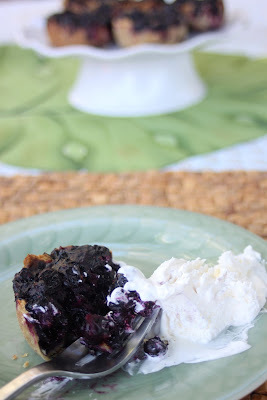 Continue to cook for about 5 minutes, stirring occasionally, until juices release and a thick, blueberry pie filling is formed. Do not bring to a boil. Remove from heat and allow to cool slightly. Remove the pie crust from the container. Place it on a flat, floured surface and roll it out to about 1/4" thickness. Using a 3" biscuit cutter or drinking glass, cut out about 10 rounds and place them into each of the muffin tins. Evenly fill the muffin tins with the blueberry pie filling to the tops of the crusts. You may have some filling left over. Bake at 400 degrees for about 20 minutes, until the pie crusts are slightly browned around the edges. Allow them to cool for about 10 minutes and run a knife or spatula around the edges of the tartlets before removing them from the muffing tins.